On my last visit to Butchart Gardens, I stopped in at the information desk to ask a question and noticed this sign. Hmmm. I wasn't born in 1936, but someone I know was. What could it mean? Inquiry revealed that to honor anyone's 80th year, the Gardens provided two complimentary entrance tickets. So I called my mom and asked if she'd be interested. She and my father were coming over in a couple of weeks. Her answer was an enthusiastic "yes!" and oohing some more over the roses. This special outing included entrance tickets AND tea for two. We each had a large teapot - Mom had the Teaberry Blend: Black Ceylon tea flavoured with strawberries, raspberries, blackberries and currants, and I went traditional with Earl Grey. There was a berry trifle to begin. Hot savouries followed: House made sausage roll, and a Roasted Onion and Asparagus Quiche. Then dainty sandwiches: Wild B.C. Salmon with mustard cream cheese, Egg salad with watercress, Smoked ham, Curried Chicken, and Cucumber with fresh ginger cream cheese. Was there room for more? Oh yes. Chocolate brandy Napoleon, Orange poppy seed loaf, Battenberg cake, Chocolate Irish cream truffle, and a French macaron. AND THEN: Scones with Strawberry jam and cream. We didn't need dinner. At all. We did take a few things home to share with our husbands. Just a few. 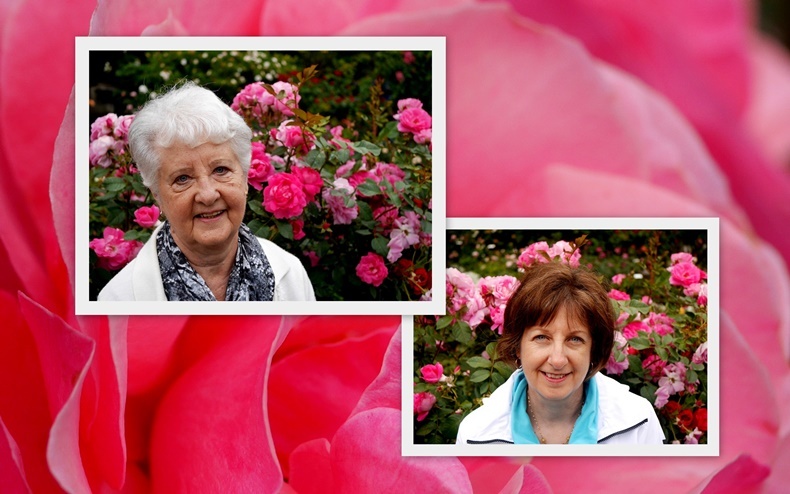 My beautiful Mom (and yours truly) in front of pink roses - always her favourite flower. Although Mom's 80th birthday isn't until August, this was a great way to celebrate. Thank you, Butchart Gardens for a wonderful treat! Linking with Mosaic Monday, hosted, for the last time, by Judith of Lavender Cottage Garden. Thank you, Judith for your time and effort in making this link up work. Now you know I love this post!! Happy 80th to your mom and what a special treat to celebrate at Butchart. Oh I just love there tea time sitting right there where you are sitting. Those sausage rolls are just yummy! And then roses too, my favorites!! Thank you for sharing the gardens and food and your mom with us! Such a lovely way to mark a special birthday - so important as the numbers go higher! You both look very happy, indeed! The flowers took my breath away...I can see why you were ooohing and aaahing. And the tea looked like it was simply divine! What a blessing for you and your mom and I'm so glad you shared your special time with us. Have a wonderful week. Hugs! Beautiful flowers, beautiful ladies, beautiful food! Oh how wonderful! And happy almost birthday to your beautiful mama. You resemble her so much and she's looking mighty fine at nearly 80. Looks like you two had a fabulous day at the gardens. Birthday wishes for your dear Mum, what a wonderful way to celebrate. The roses were indeed stunning and the tea was a feast for the eyes. Have a great week. What a perfect way to celebrate. It all looked very 'oooh-ey and aaaah-ey'! Especially the tea, what treats you had. Now that looks like a day you both will remember fondly. What a nice thing for the Butchart Gardens to do and how great that you inquired about the sign. Wonderful photos of you and your mom. Beautiful ladies. Happy Birthday to your Mom. Have loved my visits there but never experienced that amazing tea time - must come back some day and will indulge!! Butchart is always so beautiful and that day there were definitely two gorgeous, very special ladies making it even more colorful and lovely. How wonderful your mom will be celebrating another very special birthday this year - nice that's it's going to last several months! Know you must be packing by now and getting really excited - we wish you a fabulous trip. Hoping all goes smoothly and you enjoy every moment along the way. What a delightful & very special way to spend some time with your Mother, Lorrie! I wish mine were still alive to do the same. She loved to go to Millcreek Gardens here in OH to see all the roses in bloom. Butchart is just a spectacular place...I'm putting it on my bucket list! Hopefully, I'll get there before I'm 80. Such a special day it must have been, your photographs show just how much you both enjoyed the time spent together in that beautiful place. The afternoon tea looks and sounds amazing. My stepmother celebrates her 80th in September and I am planning a surprise afternoon tea party for her and the rest of the family at the award winning Davenports Tea Rooms in Cheshire. Hello Lorrie, both you and your mom are beautiful! Lovely photos. The flowers and garden look lovely. I love fuschias! The tea looks fabulous, it is a very sweet celebration for anyone who is 80. Happy Monday, enjoy your new week ahead! Two of my favourite things visiting gorgeous gardens and a bargain - what a treat. If I was the marketing department I'd have been thrilled to know you had both enjoyed the day so much. How fortunate you were in the right place at the right time to take advantage of this offer from Butchart Gardens. A lovely outing of flower gazing with your mom and tea for two as well. Nice photos of the two of you, good memories made. Thanks for linking to my final Mosaic Monday Lorrie. Truly a delightful idea Butchart Gardens has there. So nice you could enjoy the gardens together. You and your mom favor each other and she is lovely (which means the same for you.) I hope school is out by now and you are enjoying these days as you prepare for the big trip! A beautiful idea to give free admittance to those 80 yrs old...and what a garden capped off with a yummy tea....you and mom look adorable together! How wonderful that you were able to do that together. When I was there long ago, I didn't have afternoon tea. Don't remember if they just didn't offer it then or if it was the wrong time of day or what. Would have been lovely to have a day like this with my mother! Oh, what a lovely time it looks like the two of you had! Beautiful photos too! Your mom is so pretty and so are you! What a perfect outing for you both to enjoy. Wow! What a fantastic offer! I'm all about the freebies so I'm glad that you were able do an early birthday celebration of your mom's milestone birthday. What a lovely gift from the Gardens! I am glad that you and your mother were able to enjoy it together! It definately pays to have an inquiring mind. How lovely for both you and your beautiful Mom, to enjoy the Butchard flower gardens and spectacular afternoon tea, complimentary. I can certainly understand all the oohing and aahhing on both accounts. What a wonderful way to celebrate the year of your Mother's birth! My sister and and brother-in-law were visiting Butchart Gardens a few weeks ago and I was amazed by all the photos they took of the roses there. They enjoyed their visit very much and to Vancouver and Whistler. The Gardens look fabulous and the afternoon tea absolutely delicious. And your photos are excellent, as always! How wonderful for Butchart to honor those who share this important year to them. Not just an entrance fee but tea, too. Love it. Glad your mom was up for the nice day of celebration. What a wonderful visit it must have been, such a beautiful garden with so many gorgeous flowers. Thank you for taking us along with you on this virtual tour! How lovely! What a great celebration! What a wonderful place to visit with the Birthday Girl! Happy Birthday to you Mom when it really is her big day. Oh, that sounds like so much fun! What a treat from Biutchard Gardens! I like your new hairstyle too!